How did thing go this yr guys? Seen some pictures but not saying a lot for the yr. what is the team record for 2016? Good luck in all star game player picks! Hello Steelers; How are you Guys doing nowdays? How is O/L coach Bovan doing with that new O/L, I am sure that all is up and running well by now; Bigger better and more talented and better coached than our so- call 2012 was! As i recall, the 2013 renegade O/L were bigger not better than our so-called little engine that could O/L was. Less talented coaching and player selection and organization management! Too many personality conflicts, and some of those players i would have never selected! FYI: I have coached everyone of the venom players in the past and turned that team around for the one Yr.that i was there as O/L coach! From Donnelle to Truck and i have learn not to like that man very much - I would have never accepted a second conrad coleman or stone on my O/L. Facts were that i just had to laugh at the thought! U I am sure that we all learn from our mistakes; Lmao. Facts are the only thing accomplished were to dismantle An up and coming Power house! 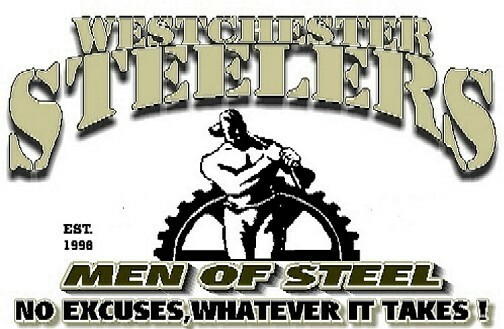 The only thing accomplished was to guarantee the dismantling of the westchester Steelers... "OMG" I always had one question in my logic; why would i choose to play Loser players Over my starters knowing that they have accomplished nothing playing for another team? This just known as poor coaching management - and organizational problem! FYI: they cut throat Game killed this aspiring organization.. God knows Best, for he is the greatest knower of all things! I can see by the lonely trophy on your mantle.... Unfortunately you lost many good players and coaches! May God Bless you guys 2016.... Signed: retired O/L coach Mr, David Fitzhugh Aka Mr. Grumpy #75. Ps. football has changed so much to the Bad that i only went to watch 1 or 2 games..... Horrible Play and organizational character... Many teams don't practice or have pregame warmups! OMG = sand lot football. WHATEVER IT TAKES! NO EXCUSES!! It was a tough loss to swallow. Up 8-6 all game and dominating. To lose with less than a minute to go on a hail Mary pass, because we only had ten men on the field. We just have to work harder and concentrate harder. With some of our defensive leaders rejoining the team, this is the time to raise the bar and amp up the team. Be there for practice Sat. at 11:00 AM. Game Sunday is 1:00 PM at Pelham Bay Park. We need to get everyone's attention on Sunday. Steelers that was probably the toughest one that I've lost since being on this team. I sit here at work on this Monday not focusing on my job at hand but asking myself how we could have played better? what I could have done differently to help my team? I hope after a loss like that the same questions are going through your head as well. Its so easy to give up and quit, go play with another team and say aw man we didnt have a line we didnt have this or that but when as a man and football player do you decide enough is enough and realize that excuses and crying dont get you wins on the field? Bottom line fellas is if we don't change anything (meaning our habits etc) we can and should expect the same results. I see so much potential in our offense and we now see we have the ability to make explosive plays with the players we have. Let's learn from this tough loss, wipe it off and get back to football!! #3(Nate)A.k.a "The no fly zone commander"
LAST FULL PRACTICE BEFORE THE CHARITY GAME NEXT WEEK, HELMETS WILL BE COLLECTED THIS SUNDAY FOR PAINTING. YOU NEED TO GET IT TO ME IN ORDER TO PLAY THE FOLLOWING WEEK. TUN IN THE SHELL ONLY, WITH YOUR NAME ON THE INSIDE.